As I mentioned last week, William and Barbara Allmandinger attended both Zion Lutheran Chattanooga and Zion Lutheran Schumm. They attended Zion Chatt before they married in 1898 and until they moved to Van Wert County about 1907 and began attending Zion Schumm. As a result I was able to use the records of both churches to research them. 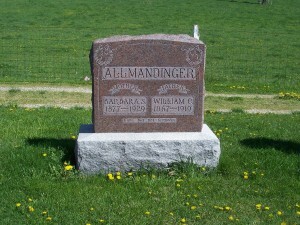 According to Zion Chatt’s confirmation records William Allmandinger was born 3 September 1867 to Ludwig and Rosina Allmandinger. He was confirmed at Zion Chatt on 6 April 1884 and married Barbara S. Hoehamer of Adams County, Indiana, on 4 January 1898 at Zion Chatt. Although William and Barbara were married in Ohio their marriage was recorded in the Adams County, Indiana, which borders Mercer County, Ohio. This seems strange but may have been common for people living near the state line. My Miller grandparents were also married at Zion Chatt but their marriage record is also recorded in Adams County, Indiana. William’s burial record at Zion Schumm gives additional information. It also states that he was born 3 September 1867 in Butler County, Ohio, the son of Mr. Louis Allmandinger. Soon after his birth he moved with his parents to the vicinity of Hamilton, Ohio, and in 1878 the family moved to Mercer County. He was instructed and confirmed in [Zion Lutheran] Chattanooga. In 1898 he was united in marriage with Miss Barbara “Hohamer” and in 1907 they moved to the Schumm area. William passed away 20 July 1919 in Fort Wayne, Indiana, at the age of 51 years, 10 months and 17 days. Survivors included his wife, 12 children, 3 brothers and 2 sisters. Zion Chatt’s confirmation records indicate that Sophie Barbara “Hochamer” was born 30 August 1877 to Nicholas and Friedericke Hochamer . She was confirmed at Zion Chatt on 22 March 1891. The funeral of Mrs. Barbara Allmandinger was held at Evangelical Lutheran church at Schumm Sunday afternoon, the pastor, Rev. R.O. Bienert, having charge of the services. The church was packed with friends and relatives of the deceased, who was held in the very highest esteem by all. 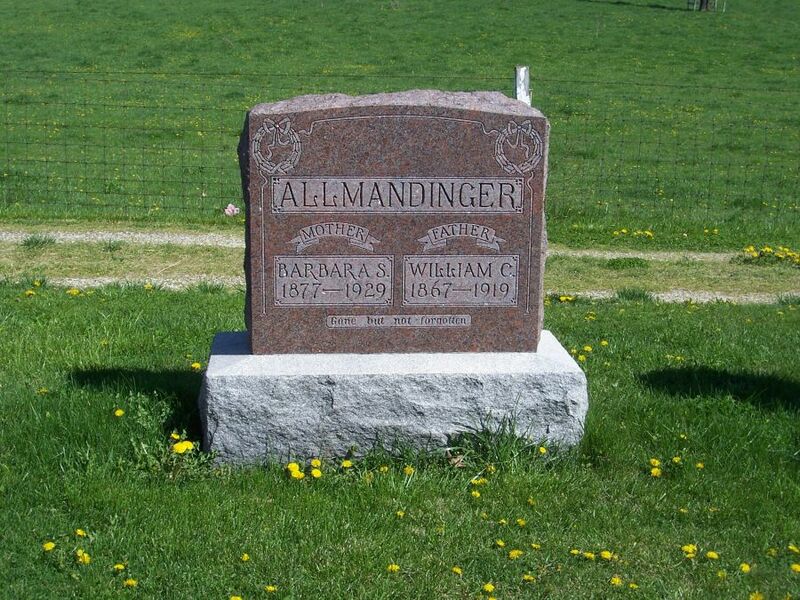 Barbara Sophia Allmandinger, daughter of Nicholas and Anna Hoehamer, was born August 30, 1877, in Jefferson township, Adams county, Indiana. She departed this life to her great beyond Feb. 13, 1929, at the age of 51 years, 5 months and 14 days. In the year 1898 she was united in marriage to Wm. C. Allmandinger. To this union were born 12 children, 6 sons and 6 daughters. Soon after their marriage they moved to what is known as the Allmandinger homestead one mile north of Chattanooga, Ohio. In the year 1907 they with the family moved to where the family now is, four miles east of Willshire, Ohio. The father was called to the great beyond 10 years ago, leaving a dear mother with 12 children to provide for, in November 1928, she became ill and bedfast, and was cared for by the family until her death. At her youth age she attended the Lutheran church and school at Chattanooga, Ohio, until 1907 when they moved to Willshire township, east of Willshire, where she became a member of the Schumm Lutheran church, holding her membership there until death. She leaved to mourn the 12 children, all living, of whom three are married: Richard, living near home; Mrs. Wm. Beard, of near Wren, Ohio, and Mrs. Glenn Adams, of Coldwater, Ohio, leaving nine children, Walter, Bertha, Hugo, Fredrick, Lillie, Minnie, Martin, and the twins, Aaron and Anna, at home; three grandchildren, two brothers, Wm Hoehamer, of Rockford, Ohio, Geo. Hoehamer, of Bryant, Indiana; two half brothers, Chas. P. Hoehamer, of Chicago, Orville Hoehamer, of Hartford City, Indiana; five step brothers, Geo. Pfeifer, Van Wert, Ohio, Nicholas Pfeifer, Fort Wayne, Indiana, Jacob Pfeifer, Bluffton, Indiana, Lawrence Pfeifer, Knox, Indiana, Fred Pfeifer, in Minnesota; two aunts, Mrs. Katherine Huser, of Van Wert Ohio, Mrs. Christena Koch, of Wapakoneta, Ohio, and a host of relatives and friends. It is interesting to note that their oldest son Richard was my great uncle, married to my grandpa Schumm’s sister Frieda. “Indiana, Marriages, 1811-1959,” index and images, Adams, Indiana, FamilySearch (https://familysearch.org/pal:/MM9.1.1/XXV3-Z9Y : accessed 16 June 2013), William Allmandinger and Barbara S. Hoehamer, 1898, citing Vol. 1: 57. “Ohio, Deaths, 1908-1953,” index and images, FamilySearch (https://familysearch.org/pal:MM9.1.1/X6ZD-VB9 : accessed 17 June 2013), Barbara S Allmandinger, 1929. Local News, The Willshire Herald, Willshire, Ohio, 14 February 1929, p.1. Mrs. Allmandinger Funeral, The Willshire Herald, Willshire, Ohio, 21 February 1929. It might have been the law that the marriage license was obtained in the county of the bride’s residence. I know that was the case in Ohio at one time – not sure about Indiana. I think you are right and that was the case back then. Although today’s Ohio marriage law states that you must apply in the county in which you want to get married. Indeed, that was true for our wedding in Illinois some 40 years ago. Remember having to drive to my wife’s home town to get the paperwork, blood work, etc. in the county seat.